If you haven’t heard of bullet journaling, it is a minimalists way to schedule your life. This is a system that combines several of your journals, schedulers, and calendars into one easy to keep track of book. Or so they say. Now before you get offended, hear me out. I tried this system back in November of last year, you can read that post here, and I failed. My failure had nothing to do with the system and more to do with my perfectionism. I wanted beautiful spreads and amazing visuals on each page. Eventually, it became too much with the holidays and I never made it to December. To be honest, I don’t even know where that notebook is currently. Now, lets discuss why this system failed for me. There are several reasons, some of them mental and some of them physical. These range from not having the right notebook, to not making the time, and not putting forth the effort. “Oh, I don’t need to write that down, surely I will remember it!” Famous last words. I never did remember it and I never did write it down. Excuse #1: Not having the right tools. Now, don’t think that you have to have the most famous bullet journal or the most expensive pens and products to do a bullet journal. You just have to be happy with what you do have. You can just use a composition notebook and a bic ballpoint. You don’t need the fancy supplies to get started, and honestly, I wouldn’t go out and buy them until you have created the habit. However, in my mind, I didn’t have the right supplies. I didn’t want to use the inexpensive supplies I had on hand because I have to get excited about a new habit, or it won’t form. If I don’t have crisp, clean notebook and a pen just for it, I won’t be happy long enough to continue. So, I bought the Leuchitturm 1917, which is like the official bullet journal. I did not buy pens for this, because I already have my Staedtler Triplus Fineliners that I love and work perfectly. I decided to only do 6 months because that would carry me to the end of the year. 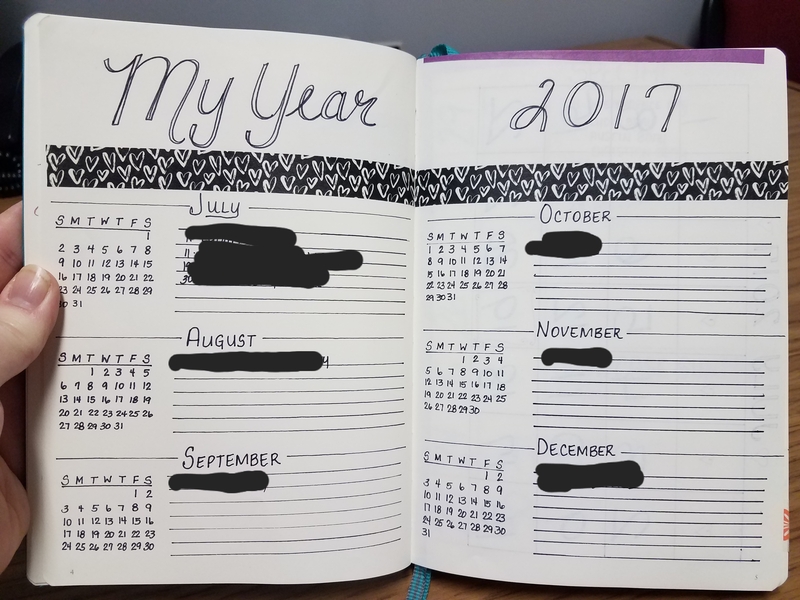 When the next 6 months arrive, if I am still doing bullet journaling, I will add it to it then another 6 month spread. Besides, who wants to get bogged down on trying to keep up with a full year at once. Guess what else? I only used black and white on this page. I want to get into the habit before I learn new ways to create the same spread. I highly recommend this way of thinking. Excuse #3 – I don’t even know what I should track or that I want to track. If you look online, especially Pinterest, you will find a huge list of trackers. But I say NAY! Don’t get bogged down with all the trackers available. Add trackers as you want to, and how you want to. Throughout the process you will find that you will come across things that are important to you specifically that you want to track. 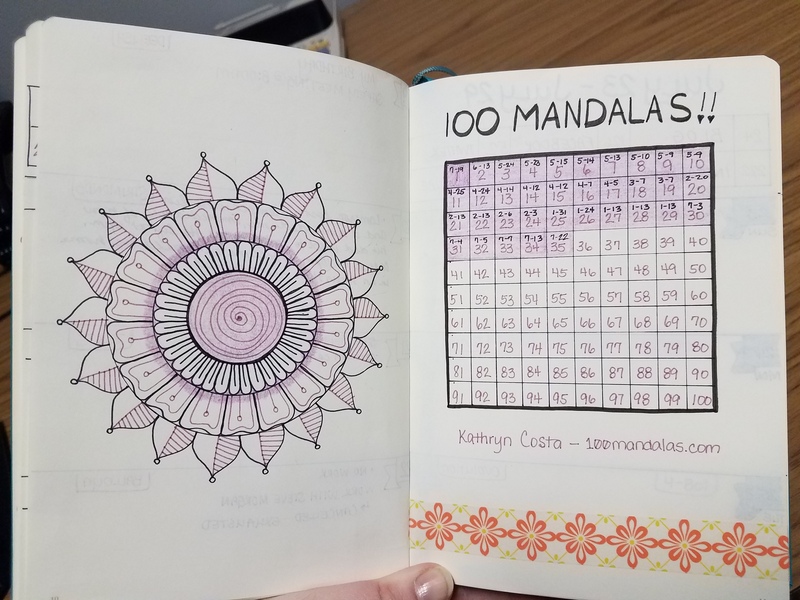 For me, I want to track my 100 mandala challenge! This challenge is important to me and something that I want to complete before the end of the year. Here is a look at how I am tracking this, in my 2-page tracker spread. As you can tell, I drew a simple mandala and also included the website where I got the challenge from. I then write a date on the number and color it in. This is my favorite spread so far. It appeals to my artistic side, as well as my need to track this challenge. Excuse #4 – I’m too depressed/anxious about keeping up with something else. Yes, depression and anxiety is something that we all have to deal with at one time or another. Some of us even struggle enough to be medicated. But that is what is so great about the bullet journal process, if you miss a day or a week, you can jump back in and there are no predetermined pages that you use up. You determine how and how much you use your bullet journal. 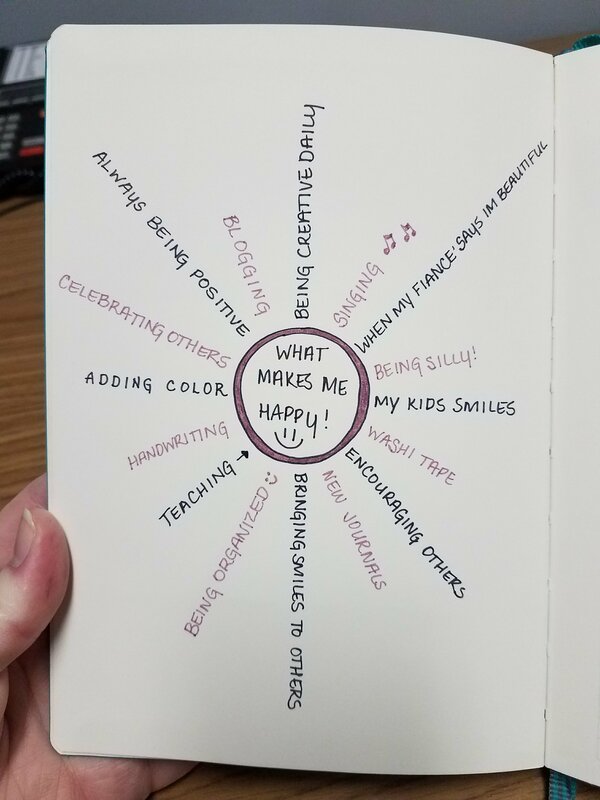 I decided to try to list all the things that make me happy and put it at the beginning of my journal. This ensures that even on the days that are considered my lows, I have something to keep me from going under. Take a look at this below. Honestly, we are all too busy if we believe it, but the truth of the matter is, we can make time for anything! After planning out my first two weeks, I saw just how busy I wasn’t. I was too busy to add work, but not too busy to add fun. So I knew by looking at these two almost blank weeks, that I would see just how much time I really had to play with. Of course, I didn’t mark down all the ER visits and power outages and mom life with many many kids, but outside the home, I didn’t have much obligations. My next step is to track my hours, find out where everything goes. Check out these two weeks below. As you can tell, they are all really really simple. So as you can tell, I didn’t want to do anything too crazy and I wanted to keep my trackers simple. At the beginning of each week, I also track my social medias. This shows me if I am doing a good job or if I need to work harder. Because I am just starting out, I feel like my numbers are embarrassing, BUT everyone has to start from the bottom. I hope you enjoyed this walk through my bullet journal. Remember, you don’t have to wait until January 1st, to start. You can start in the middle of the month like I did. The objective is to start somewhere. Do you bullet journal? How successful are you with keeping it up. I would love to know your bullet journal experiences in the comments below!